Top rated online bookie William Hill are so sure that you'll love betting with them that they're offering new customers £30 in bonus bets when you first bet £10. The William Hill new customer offer essentially means that you'll get a 300% bonus on the first bet that you place at WilliamHill.com as a new customer! Simply join William Hill and use the promo code 'C30' on their registration page and then place a single £10 bet on any of the sports betting markets that William Hill offer. Once your first bet's settled, they'll credit your account with 3 x £10 William Hill bonus bets worth £30. 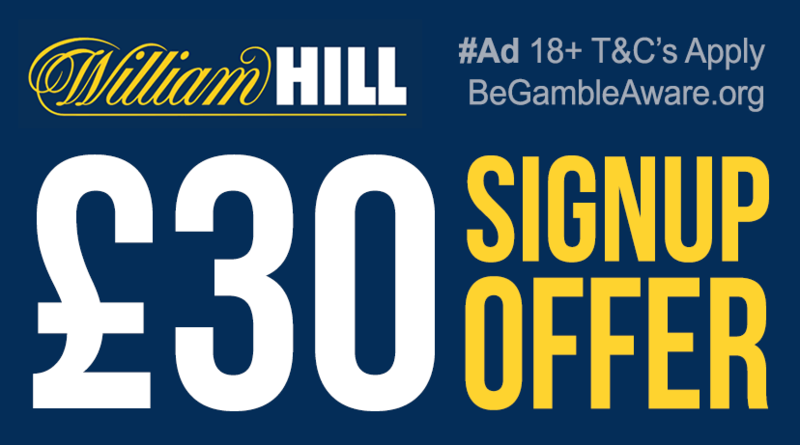 Bet £10 for £30 in bonus bets by claiming William Hill's new customer offer today! Plus, don't forget to check our William Hill promotions page for details of their latest member only offers including bonus bets and boosted odds on key markets! William Hill are well known for their excellent range of markets and 'in-play' betting options. William Hill are one of the UK's longest serving and most respected high street bookies that have successfully made the transition to operating an online betting portal. William Hill offer their members one of the nicest looking betting websites to bet on with superb range and depth of betting markets as well as highly competitive odds. We love William Hills attention to detail including their excellent betting slip and live score widgets which together add up to one of the best betting experiences you could have online. Check out our review of William Hill in our online bookies section for further info.